Meet Kelsey Finkelstein. She’s fourteen. She lives in Brooklyn. She's starting her freshman year of high school. And this is going to be the year that things finally get AWESOME. Kelsey Finkelstein doesn’t have a checking account, much less a personal Black American Express Card. No fake ID, either – not that she’d pass for 21 in a million yearseven if she did. The only couture in her closet is a Halloween costume her mom made out of an old laundry bag when she was eleven. She’s never been to a club, or had a drinkserved in a martini glass or, frankly, done anything really NYC-ish at all. She doesn'teven have a single friend who's a vampire. But don’t despair, people—Kelsey’s starting high school in less than a week! This isgoing to be the year she lives up to all of her untapped potential…finally. 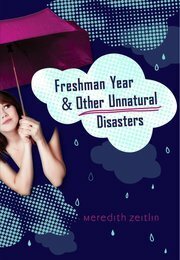 Author Meredith Zeitlin is proud to announce the upcoming release of her young adult novel, FRESHMAN YEAR AND OTHER UNNATURAL DISASTERS. Coming March 2012 and published by G.P. Putnam’s Sons, FRESHMAN YEAR follows the upsand downs of a witty, sometimes wild heroine as she navigates the uncharted waters ofcrushes, friendships, enemies, mysterious photographers, and horrifying school plays. Sounds cute! I remember going into Freshman year thinking, "oh yeah, this'll be the year I find myself." Unfortunately, the bullies found me first. But meh, Kelsey sounds fun and quirky--the best kind of heroines in contemporaries, imho!